The Bone Anchored Hearing Aid (Baha) is a surgically implanted FDA-approved system to treat specific types of hearing loss. The system transmits sound waves through the bones of the skull (i.e. bone conduction) to stimulate the cochlea, bypassing the outer and middle ear. Bone-anchored hearing devices bypass particular problems by sending sound vibration directly to the inner ear through the skull bone. This can be helpful because middle ear and ear canal problems might prevent sound waves and signals from reaching the inner ear along the typical acoustic pathway. 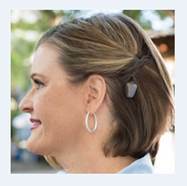 Bone-anchored hearing devices have three parts: a titanium implant, a sound processor and an external connecting element. After it is implemented, the bone-anchored hearing device works by taking advantage of the bone vibrations, a natural transmission pathway for sound to travel to the inner ear. Rather than delivering acoustic stimuli through the ear canal and middle ear, the sound processor of the bone-anchored device sends vibrations through the abutment (or via electromagnetic coupling) to the implant. In turn, the implant vibrates the surrounding bone, which sets up sound waves in the inner ear that stimulate the hair cells and result in the firing of the auditory nerve. If one inner ear is notably better, the sound goes to the better ear. If one ear has a conductive hearing loss, but a normal inner ear, the sound goes preferentially to the conductive hearing loss ear.Because this type of device requires at least one functioning inner ear, it is not recommended for the most common hearing loss that exists, bilateral sensorineural hearing loss. Because this type of device requires at least one functioning inner ear, it is not recommended for the most common hearing loss that exists, bilateral sensorineural hearing loss. Allows the recipient to hear sounds more clearly and naturally.Potential recipients can easily test the Baha so that they can experience the benefits before they have surgery. 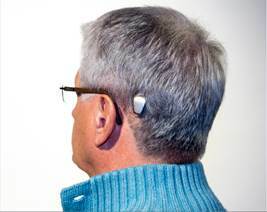 Potential recipients can easily test the Baha so that they can experience the benefits before they have surgery.System is comfortable to wear; recipients say that they forget that they have it on. System is comfortable to wear; recipients say that they forget that they have it on.The ear canal is not occluded with an ear-mold, which, for some, can cause a plugged up feeling. The ear canal is not occluded with an ear-mold, which, for some, can cause a plugged up feeling.The Baha procedure is reversible and does not damage or harm residual hearing. Additionally, the Baha system does not preclude any benefits from future hearing technological advances because it doesn’t compromise middle or inner ear or compromise hearing nerve sensitivity. 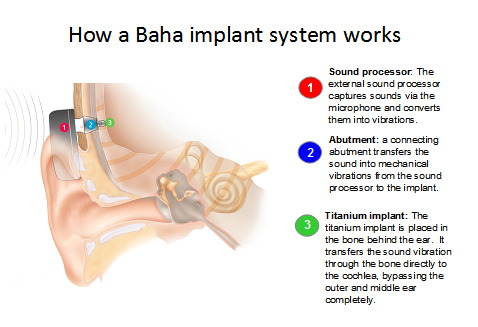 The Baha procedure is reversible and does not damage or harm residual hearing. Additionally, the Baha system does not preclude any benefits from future hearing technological advances because it doesn’t compromise middle or inner ear or compromise hearing nerve sensitivity. Many insurance companies pay for the surgical procedure and some pay for the processor. 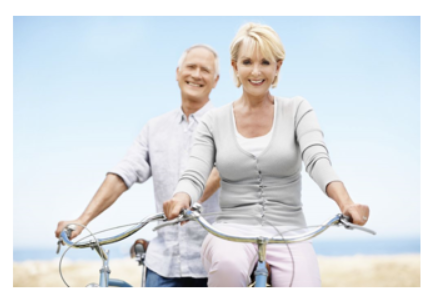 During an outpatient procedure that typically takes less than one hour, a small titanium implant – usually only 3 or 4 millimeters – is placed into the bone behind the non-functioning ear. Over time, it integrates naturally with the bone. A tiny abutment is then inserted and juts out through the skin. A removable microphone and sound processor is then attached to the abutment. Some devices are now using magnetic connections between the processor and implant, like a cochlear implant. 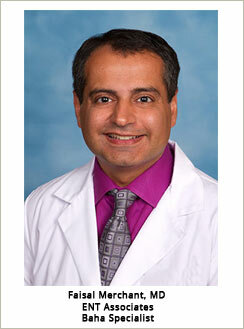 There is little post-operative pain and patients are able to return to most functions of their lives the next day. The skin is usually healed within 2 weeks. The hearing device is not worn for 2 months, the average amount of time needed for the bone to integrate into the titanium screw. Who Can Benefit from a Baha? Patients with chronic middle ear conditions or outer ear problems or congenital defects of the ear who can’t wear hearing aids may be candidates for a Baha as long as one ear has a cochlea that can hear at a moderate hearing level or better. A second category of candidates are patients with “single sided deafness”. This includes patients who have lost all or most hearing in one ear, in which a conventional hearing aid is not helpful, but have good hearing in the other. A Baha may provide an excellent hearing alternative for patients who cannot benefit from a traditional hearing aid, or in other words, for an ear that is “un-aidable” with a conventional hearing aid. Now, you may be wondering if a Baha solution is right for you. Ask yourself these questions and if you answer “yes” to any of them, then you may be a good candidate for the Baha system.